Bring a large pot of salted water to a boil over high heat. Add the potatoes, then reduce heat to medium-low, cover, and simmer until tender, about 20 minutes. Drain and allow to steam dry for a minute or two. Preheat an oven to 425 degrees F (220 degrees C). Grease an 8-inch square baking dish. Stir-fry bacon in a skillet over medium high heat for about 5 minutes. Remove bacon; pour off bacon fat. In the same skillet, melt the butter, add onions, and cook and stir until the onions are translucent, about 5 minutes. Return the bacon to the pan, add the wine, and simmer until most of the wine has evaporated. Remove from heat. Place 1/2 of the potatoes into the prepared dish; then spread 1/2 of the bacon mixture over the potatoes. Layer in the remaining potatoes, then spread the creme fraiche over them. Add the remaining half of the bacon mixture. 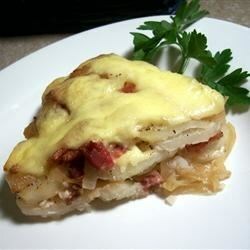 Cut the rind from the Reblochon, cut it into thin slices, and layer the slices evenly over the top of the casserole. Bake in the preheated oven until cheese is melted and a bit brown, about 15 minutes. Season to taste with salt and pepper and serve hot.